A compact sound activated RGB LED light effect that creates very bright coloured patterns in red, green and blue. Ideal for any party, event, mobile DJs and installation in small venues. 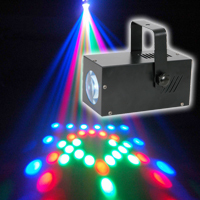 Never before has such a professional LED effect Disco Light been available for hire at this sort of price - destined to be a big hit! 42 (h) x 37(w) x 42(d)cm.